A lifelong resident of Virginia, I grew up in the rural southeastern part of the state with a large extended family. I majored in Religious Studies and minored in Creative Writing-fiction at Virginia Commonwealth University. I now live in a rural area near Richmond where five year old beagle, Leah, and her new companion beagle, Sage, have room to run. I spend my free time with my favorite activity, gardening, participate in Midlothian Wordsmith’s Workshop, and read and write as often as possible. At university, I was fortunate to have many incredible writing teachers, the most recent being authors Clint McGown, and Sheri Reynolds, bestselling author of “Rapture of Canaan”, among others. I learned from Clint McGown that prose can be as beautiful as poetry and I gained a love of southern fiction from Sheri Reynolds. 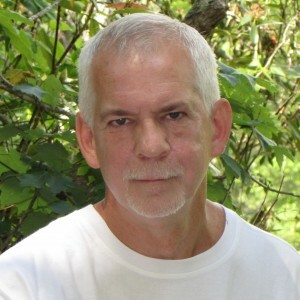 In 2012 I began writing stories about a boy growing up in the south in the 1960’s. Those stories became the collection “The Adventures of Roland McCray”. All three volumes are also in print and audiobook. Some of my books are available in or can be requested at many Public libraries and paperback versions can be ordered from several major offline book retailers. I also have a new book that is a radical change from the “Roland McCray” series- “Falling Water: Stories & Poetry” a well-received collection of unusual short stories & poetry that is also available in print and audiobook (narrated by Charles Kahlenberg). Among other projects, I’m currently working on a science fiction novel that I hope to complete in 2016. The realization when I turned thirty that I didn’t, as I’d thought when I was younger, have forever to do everything I wanted. I’d written on my own, beginning in my teens, then enrolled in college. Before I finished, I dropped out and married my high school sweetheart and became a father at age twenty-three. The marriage didn’t last, but I was blessed to have a wonderful son to raise. I spent my time working a full-time and part-time job to provide for my son, but kept writing in notebooks and journals whenever I could. When the big 30 arrived, I decided to go back to school, whatever the cost and time involved. I enrolled in Virginia Commonwealth University as a Religious Studies major with a minor in Creative Writing. My writing teachers praised my writing, even using my work as an example for the other students. Encouraged by their confidence in my talent, I continued to write after university and in 2010 I joined a local writer’s workshop, then went on to help start a new workshop, Midlothian Wordsmiths Workshop and am still active in that group. Again, I was encouraged by the other members to write more and, with their invaluable input, I completed a series of short stories and self-published the collection entitled “The Adventures of Roland McCray”. My most recent work is actually a collection of short stories and poetry based on the journals I’d been writing for years and I consider that collection, “Falling Water- Stories & Poetry”, to be my best work to date. I’m not a big outliner or my stories: I jot notes about the basic plot and characters, then more or less let my characters tell me their story. Many people do extensive outlines of their planned work, especially for novels, and if that works for you, then that’s what you should do. but I’ve always just let the story go where it will. Often, it doesn’t end up as the story I began, but that’s okay with me. Actually, yes, I do “talk” to my characters, in a sense. I always write character profiles, then have the characters “ask” each other what the character would or wouldn’t do in a given situation- and I’m often surprised by the insights gained from allowing the characters to speak to one another! If asked to give an aspiring writer advice (as happened often in the writing classes I took in college), I’d simply say- Read, read, and read some more. I believe the best way to learn to write is to read as much as possible- it’s helped me during my years out of school. And find a local writer’s group to join; you can learn a lot from other new writers and may find that you have an unique perspective that will help them, as well. I self-published because my work (to date, at least) has been short stories and traditional publishers don’t publish short story collections- they’re just not profitable enough for traditional book publishers to put money into on the relatively slim chance they’ll make a profit. I started with Amazon Kindle books, then expanded to other online eBook retailers. I also have published my four short story collections in print-on-demand service. CreateSpace, although there are other print-on-demand companies as well. My books are all in audiobook now, through Audible because Amazon and Apple iTunes will only sell audiobooks produced by Audible. As far as selling, my experience may or may not be typical, but I think it’s close to the same for all self-published authors. eBooks are the fastest sellers, print books return the greatest royalty per book, and audiobooks really don’t pay a lot at all, but are definitely helpful to have. Since eBooks are the biggest sellers and fairly easy to publish, I’d recommend those first, but- having a print copy is a good idea because many people will pay more to have the feel of a real book in their hands and audiobooks are becoming more popular because just about everyone has a “smartphone” now and their are apps for all of them, making it easy to listen to a book while waiting for an appointment or through a car’s sound system when traveling. Print books, both hardcover and paperback, will always have a place in publishing, but the majority of new books are in eBook format because they cost the reader less and hundreds at a time can be carried along wherever the reader goes. I have more than 1,200 Kindle books to choose from and I could never before had that much variety available at any time before. I remember the “dark” days of going to the public library and checking out the seven book maximum, then having to return those books in order to check out more. Of course, I bought a lot of print books, but could only justify buying four or five a year due to the cost. In short, I think electronic books are the future of publishing, with print books not disappearing anytime soon, if ever.